Usually I write my reviews immediately after finishing a book - I go based on exactly how I feel after I turn that last page or finish swiping left... but I slept on this one. We have three women thrown together in a dorm room their freshman year. Kate, the popular one whose father pretty much owns the city; the one everyone follows, the pretty, carefree, selfish and manipulative third of the Whipple Trips. Jenny, the fiery Latina who works hard at everything she does, a control freak who works best when solving problems, ultimately creating her own in the process. Audrey, the girl from the wrong side of the tracks, poor, desperate for friendship and love which takes her down the wrong path. Their promise to be friends forever was the beginning of their end. The book is basically in two parts, the first half mainly concentrating on their first year in college, with tiny bits to present day, 20 years later at what is clearly not a fun reunion. Then the second half catches up to the present day where the whodunit portion starts to finally reveal itself. They almost felt like two different stories... somehow I think if they had been intertwined more rather than feeling somewhat abrupt from one half to the other it may have been more fluid. There is not one likable character. Not ONE. Which I don't normally mind, but I couldn't connect with any of them either. Kate is followed blindly by everyone but why? Supposedly she has redeeming qualities but that is not shown anywhere. The author does do a good job in showing the dynamic between the three but their friendship doesn't really seem to sustain beyond that first year - they only seem tied to one event they hope stays buried. I did love the ending though - up until the last few pages, I was wondering who actually did what. Every time I thought I knew, I got side lined again. I read this book in one day so the story kept my interest enough to keep turning the pages but I'm happy to never see these characters again. Kudos to the author for selling these flawed characters. 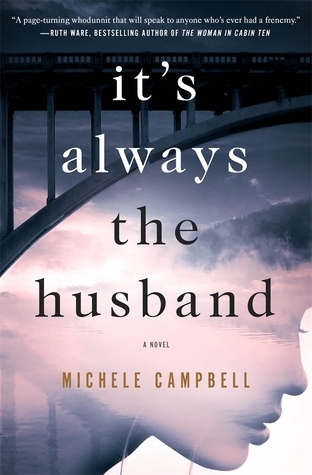 This is perfect for those who love some suspense in a slower paced domestic thriller. A solid 3.5 stars - thanks to St. Martin's Press for this advanced copy in return for my honest review.